"Check out the flashy new brochure we just added" - linking to Content. "Remember to complete your timesheet every fortnight" - linking to Forms. Click create new notification in Communicate. You can select to Send to all active users or select switch off and enter in the name of a group or individual. You can schedule the notification by entering a date and time. If you do not provide a date, the notification message will be sent immediately. If required, choose the relevant area to link the notification message to. For example link to the forms section when sending a message about a new form. Enter the notification message. You have a 500 character limit here. 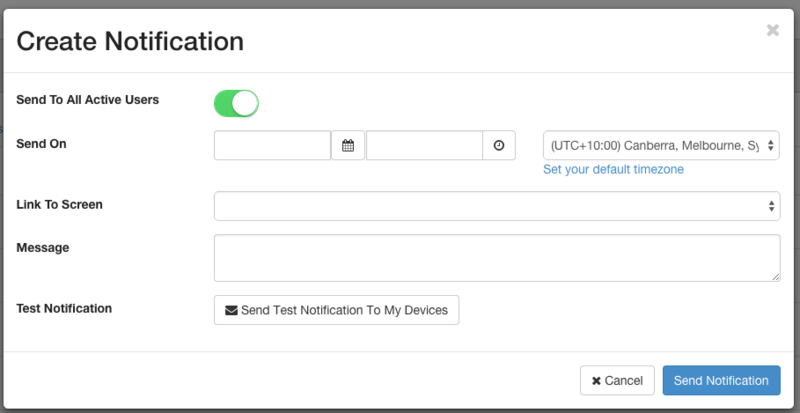 You can also choose to send a test message to your own devices first. 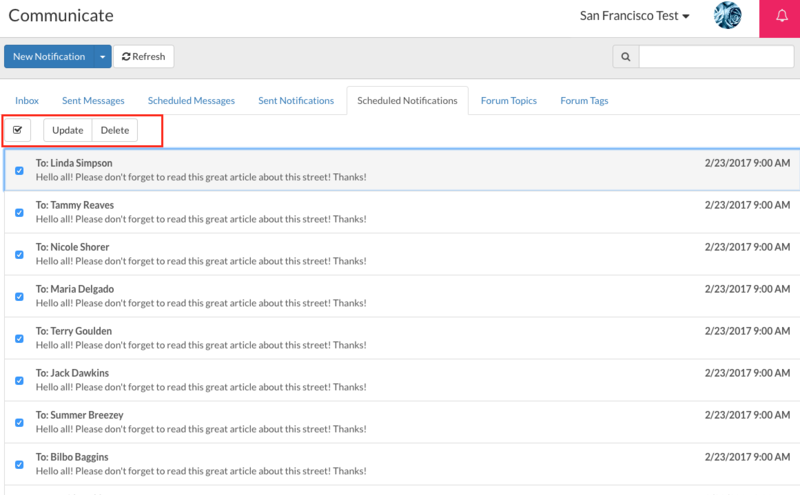 To view Sent Notifications, click on the Sent Notifications tab in the Communicate module. When notifications are delivered and or viewed, the 'Sent' or 'Read' date and time will appear in the list. Note: You can filter on sent notifications by using the 'Status' and 'Sort' options available in top-right hand corner of the sent notifications tab. Edit Time/Date and Messages in Scheduled Notifications. Notifications that have been scheduled to be sent out on a future date can be edited if you decide to change the date/time to send the notification, or if you'd like to change the message. To view and change Scheduled Notifications, click the Scheduled Notifications tab in Communicate. Click the check box beside a message and you will notice the Update & Delete options will appear. You may select multiple messages and make changes in bulk, or you can edit a single message. 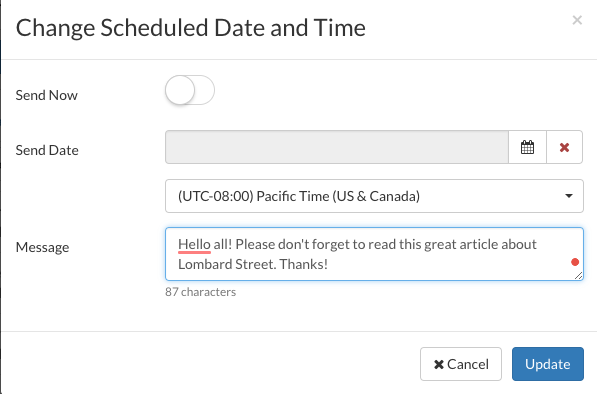 Click Update to make your changes to the scheduled date and time, and/or the message itself. When you've finished making your changes, click Update. Send Push Notifications to Child org accounts from a Parent org account. Note: A Parent-Child hierarchy is an account configuration in Zunos, contact the Zunos Customer Success team for more information about this feature. Push notifications can also be sent to Child account users from the Parent account. This is a great way for administrators to quickly inform all of their Child account users from one Parent account. To use this feature, be certain that you are in your Parent account organization. Continue to use the same instructions above with the exception: Click in the "Include all users for child organizations" field to see a selection of the Child organizations. Select one or multiple Child organizations.